Although Wilder’s work holds a significant place in the history of children’s literature and continues to be read today, ALSC has had to grapple with the inconsistency between Wilder’s legacy and its core values of inclusiveness, integrity and respect, and responsiveness through an award that bears Wilder’s name…This change should not be viewed as a call for readers to change their personal relationship with or feelings about Wilder’s books. Updating the award’s name should not be construed as censorship, as we are not demanding that anyone stop reading Wilder’s books, talking about them, or making them available to children. We hope adults think critically about Wilder’s books and the discussions that can take place around them. For reasons of my own, I’ve been thinking about this issue a lot recently. Last week at Worldcon, a critic who had recently finished reading Astounding commented that he wasn’t sure he would have wanted to meet any of its subjects, and I know what he means. (If I had the chance to spend time with a single person from the book, I might well choose Doña Campbell, or possibly Leslyn Heinlein, if only because I’d learn more from them than I would from any of the others.) I didn’t go into this project with any preexisting agenda in mind, but I emerged with a picture of these four writers that is often highly critical. John W. Campbell’s importance to the history of science fiction is indisputable, and I wrote this biography largely to bring his achievements to the attention of a wider audience. He also expressed views that were unforgivably racist, both in private conversation and in print, and he bears part of the blame for limiting the genre’s diversity, which is an issue that we’re still struggling to address today. I think that Robert A. Heinlein is the best and most significant writer that the genre ever produced, but I’m not sure I would have wanted to be the the same room with him for very long. Hubbard, obviously, is a special case. And perhaps the most difficult reckoning involves Isaac Asimov, a writer who meant a lot to me—and to countless others—growing up, but whose treatment of women looks increasingly awful over time. It was hard for me to write about this, and I expect that it will be hard for many others to read it. It’s safe to say that many fans made up their minds about Heinlein and Hubbard years ago, while this book will introduce Campbell to a larger readership for the first time in what I hope will be his full complexity. With Asimov, however, I suspect that many readers will need to revise their understanding of a man they admired and thought they knew, and that might be the hardest part of all. At the convention, I conducted what I saw as a trial run for discussing these issues in public, and the results were often enlightening. (Among other things, I found that whenever I brought up Asimov’s behavior, many fans would start to silently nod. It’s common knowledge within fandom—it just hasn’t been extensively discussed in print.) At my roundtable, an attendee raised the question of how we can separate an artist’s life from the work, which prompted someone else to respond: “Well, we choose to separate it.” And third person nervously hoped that no one was suggesting that we stop reading these authors altogether. On the individual level, this is clearly a matter of conscience, as long as we each take the trouble of engaging with it honestly. Collectively speaking, it isn’t always clear. Occasionally, the community will reach a consensus without too much trouble, as it did with Hubbard, which is about as easy as this sort of decision gets. More often, it’s closer to what we’ve seen with Wilder. As Fraser notes: “While the answer to racism is not to impose purity retroactively or to disappear titles from shelves, no eight-year-old Dakota child should have to listen to an uncritical reading of Little House on the Prairie. But no white American should be able to avoid the history it has to tell.” In a New York Times article on the controversy, the scholar Debbie Reese makes a similar point more forcefully: “People are trying to use [these books] and say, ‘Well, we can explain them,’ and I say: ‘Okay, you’re trying to explain racism to white people. Good for those white kids.’ But what about the Native and the black kids in the classroom who have to bear with the moment when they’re being denigrated for the benefit of the white kids?” If nothing else, renaming the award sends a clear message that this conversation needs to take place. It’s manifestly the first step, not the last. If the books are to be read and taught today—and it’s hard to escape them given their popularity—then teachers, librarians and parents are going to have to proceed armed with facts and sensitivity…I’d like to think that what would matter to Wilder in this debate would be not the institutionalized glory of an award bearing her name but the needs of children. “I cannot bear to disappoint a child,” she once said. Campbell, to be frank, might well have welcomed the “institutionalized glory” of such an award. But he also wanted to be taken seriously. As Fraser says about Wilder, we can love or hate him, but we should know him. And a discussion about the future of the Campbell Award may well end up being the price that has to be paid for restoring him—and the entire golden age—to something more than just a name. At some point, as I was preparing for last week’s World Science Fiction Convention, I realized that there was a good chance that I would run out of books. This wasn’t a problem that I ever expected to have. Astounding isn’t due to come out for another two months, and the hardcovers aren’t available yet, but in the meantime, my publisher printed up a bunch of advance copies, or galleys, which we’ve been sending to reviewers, media outlets, and everyone else we might want to reach. The number of galleys is relatively large, but not unlimited, and about a month ago, I began to hear rumblings that we were coming up short. (One issue is that we sent a hundred copies to Comic-Con, which sounds awesome in theory, although I wish that we’d saved them for Worldcon, which is much closer to this book’s target audience.) After scrambling to get copies from various departments, I ended up with two dozen galleys that could be spared for San Jose, which I supplemented with a stack from my stash at home. Some of these ended up being handed out at a booth run by the Science Fiction and Fantasy Writers of America, while I set aside ten others for attendees at my roundtable and for a few special recipients. As a result, I was left with just six copies to give away at my reading, which drew a sizable turnout. Since I couldn’t give a copy to everyone, I had to think of ways to distribute the ones that I had, and it occurred to me to give a book to the youngest person in the room. Toward the end, I looked out at the audience and said, “Raise your hand if you’re under thirty.” And in a crowd of over one hundred people, exactly two hands shot up. I had much the same experience at my other events, at which I saw perhaps half a dozen people who were under thirty years old. In nearly every case, I was among the youngest people in the room. (As far as I know, I attracted just one audience member across the entire week who was under twenty. He showed up to my second event, and I didn’t get his name, but if he’s reading this now, I’d like to hear from him. I think he deserves a copy, too.) Two years ago, after MidAmeriCon II in Kansas City, I wrote a blog post noting that I kept seeing the same fifty faces at my panels. I was aware that the average age at Worldcon has long been higher than that at similar gatherings, but it still felt as if I were spending the weekend at a convention within the convention—an enclave in which a vibrant but graying crowd was gathering to celebrate writers, stories, and a shared history that the larger community was beginning to forget. Now that more time has passed, it feels even more true today. Fandom is inexorably growing older. We’ve recently lost important personalities, such as Gardner Dozois and Harlan Ellison, who had embodied much of its institutional memory. And it isn’t clear whether new voices are emerging to replace the old ones. While I was in San Jose, I made time to meet up with a few younger writers whom I happen to know, and I saw a few familiar faces in the hallways, but for the most part, I spent the week at a slight remove from the authors and fans who looked like me, or who come from approximately the same generation. And as I’ve noted before, I occasionally have trouble making the case that they should take an interest in a book about these four writers. But I’m not going to talk about that problem here, or lament the generational divide, if one even exists, within science fiction. Instead, I wanted to raise two points that I’ve only gradually been able to admit to myself, but which seem relevant to talking about this book and how it happened to emerge. The first is that I’m naturally more comfortable among older writers than I am among those my own age. I could explain this by saying that my interests tend to skew older anyway, which is true enough, but that isn’t the real reason. If I’m honest with myself, I have to admit that it’s a defense mechanism—I feel so competitive around other writers my age that I can never fully relax around them, particularly if we’re at a similar point in our careers. It’s an aspect of my personality that I don’t love, and I’ve tried to get past it, but in the meantime, I tend to have a better time with writers who are at a different stage than I am, even if they’ve accomplished more than I ever will. The other key point is that I like being among the younger people in the room, and there’s a part of me that wants to extend that feeling for as long as possible. My choice of subject wasn’t consciously motivated by this, but I can’t rule it out. I’m often asked why someone my age would take an interest in this period, and I never get tired of the question, because the number of fields at which I can come across as a wunderkind is rapidly diminishing. If I were publishing my first novel, any interviews or profiles would make a point of describing me as a late bloomer, and if I were trying to break into screenwriting, I might actively lie about my age. I’m not even particularly young when it comes to literary nonfiction. But the golden age of science fiction offers a kind of optical illusion that makes me seem like more of a prodigy than I really am. My point, I guess, is that a writer’s choice of subject is necessarily motivated by personal ambition, even by vanity, as well as by what the market will bear. (When people ask why I wrote a book about John W. Campbell, I respond, honestly enough, that he fascinates me—but I was also ambitious enough to grab a huge unexplored subject as soon as I saw that it might be possible for me to lay claim to it.) I may look out of place at these events, but that’s how I like it. Like many writers, I’m an outsider who longs in secret to be an insider, while still proclaiming my own difference, and I happened to stumble into a subject where this was still possible. Fortunately, I think that it also resulted in a good book, and one that nobody else could have written in quite the same way. From a marketing perspective, it doesn’t hurt that I look slightly different from its four central subjects, and the fact that I came at it from the outside allowed me to approach in ways that wouldn’t be possible for a lifelong fan. I’m obviously far from an unbiased critic of the result, but I do believe that this book benefited from being written from a place of detachment. Yet it was also born of my desire to find a big topic to tackle, as well as to earn a place in that room. Scratch the surface of any book, or a creative project of any kind, and you’ll find similar motivations. I might not have conceived of this project at all if I were the kind of writer who could feel at home anywhere else, and I don’t know if I’ll be able to do it again. But if there’s one thing that I took away from Worldcon this year, it’s that the room where I seemed most out of place is also the only one in which I wanted to belong. I just got home from the World Science Fiction Convention in San Jose, which was an exhausting, enlightening, and mostly wonderful experience. My primary objective, not surprisingly, was to get out the word about my book Astounding, which was originally scheduled to come out last Tuesday, or the day before the convention began. At the last minute, my publisher—for perfectly valid reasons—pushed back its release date by two months, so instead of flying in with boxes of finished hardcovers for sale, I had to do what I could with a few advance copies, some promotional swag, and myself. And I wasn’t sure how it would go. Half an hour before my first event, at which I would be talking about the book on my own for fifty minutes, I told myself that if twenty audience members showed up, I’d be happy. (I was even ready with a funny remark in case only four or five of my friends appeared, which has happened at readings I’ve done in the past.) When I finally arrived at my assigned room, there were already attendees waiting outside the entrance to get in. Every seat was filled. There were people standing at the edges of the room and seated on the floor. I was blown away, and the event went great. It was only afterward that I reflected that if there’s one time and place in the world where I should be able to draw a crowd for a book like this, it was last Thursday at the San Jose Convention Center. It’s still the center of science fiction fandom, especially for an older generation, and it’s where this project was born. Looking back, I see now that if I hadn’t been able to fill the room, or if only half the chairs had been occupied, it would have been a very bad sign. And the fact that it went well is at best a neutral indicator for how it will fare in the world beyond Worldcon. But I can’t deny that I was gratified and moved by the response. In the days that followed, I held a casual roundtable with readers and moderated a panel on John W. Campbell featuring Robert Silverberg, Greg and Astrid Bear, Joe Haldeman, and Stanley Schmidt, which also drew a sizable crowd—although I wasn’t really worried about that one. I also had a good time tracking down people in the lobby and at parties, and I heard a lot of kind words from attendees who were looking forward to the book. (My five-year-old daughter, pictured above, also had fun. She spent most of the trip with my parents and my very understanding wife while I ran around to various events, but I brought her by the convention center a few times. One of the high points of my life was when she met Silverberg, which I hope will someday feel like a historical moment in itself.) But it also left me with a host of unanswered questions about this project, its subjects, and its future. I interacted with hundreds of enthusiastic fans about this book, but only a handful were under thirty. At my first event, I took questions for half an hour, and the majority weren’t about Campbell, Asimov, or Heinlein, but Hubbard, which points to an untapped interest in his career as a science fiction writer that I hadn’t entirely anticipated. For most of the last two years, I’ve been thinking about how the unpleasant aspects of a writer’s personal life can affect how we read the work, and the convention turned into something of a trial run to see how these problems play out in public, with mixed results. I’m still trying to sort out my own thoughts, but over the next few days, I’ll do what I can to work through some of the issues that I took away from San Jose. 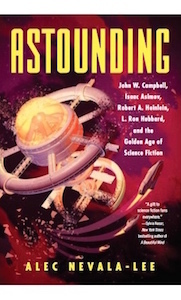 Astounding: John W. Campbell, Isaac Asimov, Robert A. Heinlein, L. Ron Hubbard, and the Golden Age of Science Fiction is now scheduled to be released on October 23, 2018. It was originally slated for August 14, but my publisher recently raised the possibility of pushing it back, and we agreed on the new date earlier this week. Why the change? Well, it’s a good thing. This is a big book—by one estimate, we’re looking at close to five hundred pages, including endnotes, back matter, and index—and it needs time to be edited, typeset, and put into production. We could also use the extra nine weeks to get it into bookstores and into the hands of reviewers, and rescheduling it for the fall puts us in a better position. The one downside, at least from my point of view, is that now we’ll be coming out in a corridor that is always packed with major releases, and it’s going to be challenging for us to stand out. (It’s also just two weeks before the midterm elections, and I’m worried about how much bandwidth readers will have to think about anything else.) But everybody involved seems to think that we can handle it, and I have no reason to doubt their enthusiasm or expertise. In short, if you’ve been looking forward to reading Astounding, you’ll have to wait two months longer. (Apart from an upcoming round of minor edits, by the way, the book is basically finished.) 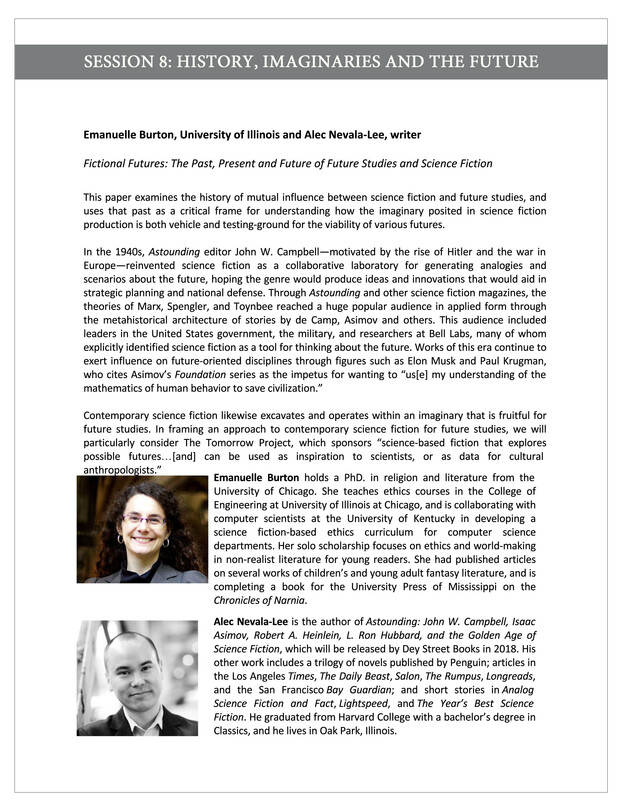 In the meantime, at the end of this month, I’m attending the academic conference “Grappling With the Futures” at Harvard and Boston University, where I’ll be delivering a presentation on the evolution of psychohistory alongside the scholar Emmanuelle Burton. The July/August issue of Analog will feature “The Campbell Machine,” a modified excerpt from the book, including a lot of material that won’t appear anywhere else, about one of the most significant incidents in John W. Campbell’s life—the tragic death of his stepson, which encouraged his interest in psionics and culminated in his support of the Hieronymus Machine. And I’m hopeful that a piece about Campbell’s role in the development of dianetics will appear elsewhere in the fall. I’ve also confirmed that I’ll be a program participant at the upcoming World Science Fiction Convention in San Jose, which runs from August 16 to 20. At one point, I’d planned to have the book in stores by then, which isn’t quite how it worked out. But if you run into me there, ask me for a copy. If I have one handy, it’s yours. There were thousands of fans in attendance at last week’s World Science Fiction Convention, but I swear that I kept seeing the same fifty faces. With the exception of a reading that I did with a few writers from Analog, all of my events revolved around the history of science fiction, which an emphasis on stories and authors from the golden age. Not surprisingly, the audience at these panels tended to skew older, and many attendees had clearly been coming to Worldcon for decades. I was almost always the youngest panelist at the head table, and I can’t be sure that I wasn’t also the youngest person in the room on more than one occasion. Whenever we discussed the genre, the same handful of names kept popping up, and many of them would have inspired blank stares from a younger crowd: John W. Campbell himself, of course, but also writers like E.E. Smith, author of Gray Lensman, and A.E. van Vogt. (At one point, at a discussion titled “Classics in the Corner,” I said: “I’m not sure how many people read E.E. Smith these days.” A lot of hands shot up, which led another panelist to observe: “This is probably the wrong room to ask that question.”) And although I was aware that the average age at Worldcon has long been higher than that at most similar gatherings, and it seems to get older every year, it felt as if I were spending the weekend at a convention within the convention—an enclave in which a vibrant but graying crowd gathers to celebrate writers, stories, and a shared history that the larger community is beginning to forget. And these fears are far from groundless. A high point of the weekend, at least for me, was a roundtable discussion held by the academic conference about Campbell and the golden age. The tone of the panel was reverent, if not toward Campbell personally then toward his impact on the field, and the only discordant note was struck by a panelist who noted that his writing students aren’t especially interested in Campbell these days—if they’re even aware of who he was. In response, Robert Silverberg said: “You can’t see oxygen, either, but that doesn’t mean it isn’t real.” But I don’t think there’s any doubt that the dissenting voice had a point. For a lot of younger writers, Campbell is a tertiary influence, at best, and he certainly isn’t the living presence that he was for the fans and authors of an earlier generation. His place has largely been taken by more recent artists whose struggles and victories seem more urgent than those of writers whose best work was published before World War II. When you look more closely, of course, you find that their concerns are far closer to the present than they might first appear, and you can draw agonizingly important lessons from their example. But this takes time and energy that a lot of younger writers have rightly devoted to other matters. It was Campbell himself, I think, who observed that readers are essentially hiring writers to perform a service: to think more deeply about a subject than they can for themselves. And my hope is that the book I’m writing will do some of the necessary legwork, allowing writers and readers my age or younger to plunder Campbell, Heinlein, and all the rest for what they have to offer. This only reflects my own journey, which has more in common, in many respects, with the young writers who aren’t aware of Campbell than with the older fans and authors whom I’ve encountered along the way. I came into the genre as randomly as most of us do, assembling my picture of it from an assortment of heterogenous materials: a single issue of Isaac Asimov’s Science Fiction Magazine, now lost, which I got for Christmas when I was twelve and replaced a few days ago with a copy I bought at the dealer’s room at the convention; novels by writers like Madeline L’Engle, Jane Yolen, and Orson Scott Card; and the nearly simultaneous discovery of Jorge Luis Borges and The X-Files. None of it was systematic, or even conscious, and my exposures to older influences weren’t exactly in the best possible order. (When I mentioned at a panel that the first Heinlein novel I ever read was The Number of the Beast, there was an audible gasp.) I’d been writing science fiction seriously for almost ten years before I realized that I was harking back, without knowing it, to stories like “Who Goes There?” and Sinister Barrier. It wasn’t until I began thinking about this book that I sought out authors like Smith or van Vogt, and I’m constantly confronted by areas that I have yet to explore. Part of me wishes that I’d been more deliberate about it much earlier, but that isn’t how fans evolve. And in trying to go back and build myself into the kind of reader who is capable of tackling Campbell and the others on their own terms, I’ve become more conscious both of what the different generations of fans have in common and of the ways in which they continue to diverge. But I’ve also come to realize that older and younger fans are snapshots of a single continuum. The Futurians, as I’ve noted before, were incredibly young when the fan community began—most of them were still living with their parents—and the patterns that they inaugurated are still being played out online. We think of these guys as men with white beards, but that’s only because what they alternately created and rebelled against has endured to the time of their grandchildren. (When Slan won the Retro Hugo award for Best Novel on Thursday, A.E. van Vogt’s granddaughter was there to accept it, and she got the most rapturous round of applause that I heard all weekend.) On the last night of the convention, I found myself at the Hugo Losers Party, which began decades ago as an informal gathering in George R.R. Martin and Gardner Dozois’s hotel room and has been transformed since into a lavish event with hundreds of guests. It felt like a real moment of catharsis, after a weekend that had been charged with powerful emotions and occasional tensions, and it threw a random sampling of attendees onto the same dance floor and shook them all up. Looking around the Midland Theatre, I saw emerging writers and aging legends standing side by side, or crowding into the same elevator, and it was more clear to me than ever how one ripens into the other. Virtually everyone enters the fandom at a young age, and even if the years have started to show for some, it only puts me in mind of what James Caan reminds us in The Way of the Gun: “The only thing you can assume about a broken-down old man is that he’s a survivor.” And I should only be so lucky to survive as long.